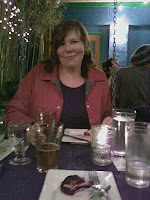 Carla and I had a great time at East Burn's Beer Belly Dinner last night. It was the one-year anniversary of the dinners, so they brought back Full Sail's John Harris as the guest brewer, since he did the first such dinner. A new beer was previewed, Hop Pursuit Extra Pale Ale, and I got to try the Pilsner Room exclusive Slainte Stout for the first time. The appetizer courses matched up well with the two lagers of the evening: Session Black and LTD 1, and of course any night is a good night if the dessert is served with barrel-aged Top Sail Imperial Porter. Hop Pursuit is a nice biscuity pale that John said was his way of getting back to his brewing roots, with the "old-school hops" that were all he had to work with early in his brewing career: Willamettes, Mt. Hoods, and Cascades. It will be out in 22-ounce bottles in a few months as part of the Brewmaster's Reserve series. There are lots of flowery hops in there, but it's not overly bitter. Nice stuff. These Beer Belly dinners are a great deal, $35 a head for five wonderful courses paired with beer. The setting on the East Burn's patio is pleasant and relaxing, especially if you get one of the tables with porch-swing seats. Best of all, the proceeds from the dinners benefit a worthy cause: Ride On, the non-profit organization that will drive you and your car home for a small fee if you've had too much to drink. I foolishly forgot to bring a camera, so all I got were some blurry cellphone pictures. Blurry and dark -- it wasn't until the cheese course that I figured out the night-photo feature of my new phone. I wish I could show you the massive pork chops we were served, or the delicious pork-belly skewers candied and dusted with Indian spices. [Update: A generous reader is willing to share her pictures of the dinner. Check out those courses.] Last night's menu was very pork-o-centric, but I noticed that a diner at the next table was provided with vegetarian replacements, so I suppose if you call ahead they'll accommodate you. Next month's dinner features San Francisco's 21st Amendment Brewery. Good food, good beer, good deal, all for a good cause. My boyfriend & I were at the dinner last night as well. I was the one taking all the pics. Will be uploading them to Facebook shortly and happy to share with you in Picasa, too. Thanks! Can I put a link to your picasa folder into the post? and also please double check my captions and let me know if I've misidentified anyone or anything. Those are great pictures, better than what I would have taken. Thanks for sharing them! I didn't notice any wrong captions.